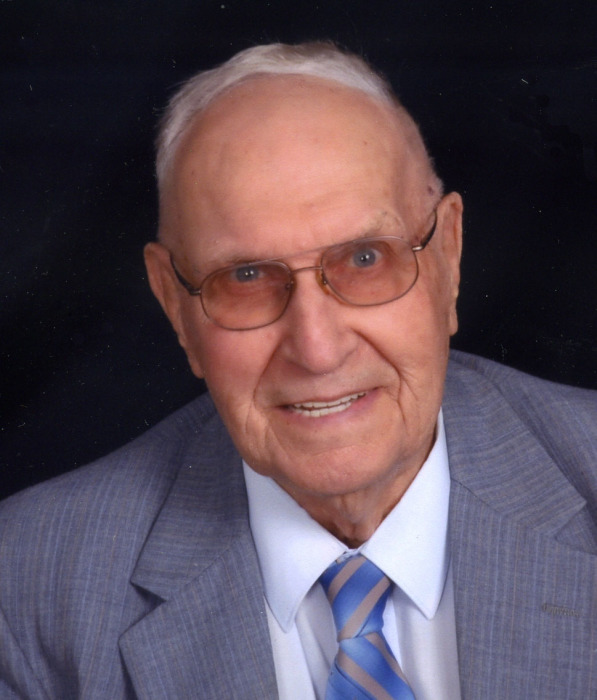 Funeral Services for Elmer Joel Stensrud, of Freeborn, Minnesota will be held at 10:00 A.M. on Saturday, at the United Methodist Church in Albert Lea. The Reverend John Mitchem and Pastor Kent Otterman will officiate. Interment will be in Freeborn Cemetery. Visitation will be from 5 p.m. – 7 p.m. Friday at Bonnerup Funeral Service, Albert Lea, and one hour before the service at the church. Elmer died on Wednesday, March 21, 2018 at Good Samaritan Society, Albert Lea. He was 88. He was born on May 3, 1929, near Freeborn, Minnesota the son of H. Olaves and Erma (Olson) Stensrud. He graduated from Freeborn High School in 1947 and then farmed, with his Dad and brother Glen, north of Freeborn. In addition to a lifetime of farming, Elmer also proudly drove school bus for Freeborn and USC School districts for more than 54 years, was a Pioneer Seed Corn Dealer, was active in the ASC County Committee and the Freeborn Boosters Club. A longtime member of the Freeborn Congregational Church, he held many offices and served on several committees. Elmer's first date with his soulmate, Merle L. Larson, involved attending a men’s Gopher basketball game.On August 28, 1960, Elmer and Merle were married in Freeborn, Minnesota. To this union three children were born, Carol, Joel and Dale. Together, they enjoyed following the Golden Gophers, with a history of 58 years of Men's Basketball season tickets. Elmer had been active in basketball and softball in high school, continued playing on local town teams and also enjoyed all spectator sports. Elmer is survived by his wife, Merle of Freeborn, MN, his three children and their families: daughter Carol (Brian) Schultz of Wells, MN and children Katie (Nate) Walton, Noah, Grace, Selah and Titus of Bricelyn MN, Jennifer (Eric) Wendinger, Carson, Aubrey, and Bethany of Fairfax, MN, Sarah (Cole) Ramsley, Maya of Fairfax, MN, Laura Schultz of Wells, and Andrew Schultz of Wells; son Joel (Linda) Stensrud of Freeborn, and children Chad (Hannah) of Freeborn, MN, Jessica (Brad) Tomschin (with a blessing soon to arrive), of Alden, son Dale (Stacie) Stensrud of Freeborn and children Kayln Stensrud of Freeborn and Brayden Stensrud of Mankato, MN; sister Myrna McKean of Freeborn, mother-in-law Leona Schwartz of Northfield, MN; sister’s-in-law and brother’s-in-law: Jan Prescher of Ellendale, Joyce Stenzel of Albert Lea, Lowell and Toni Larson of Dent, MN, Ken and Wendy Larson of Austin, MN, Kevin Schwartz of Arizona, Judy Schwartz of Shakopee, MN, Barb and David Gingrich of Eagan, Phillip Morreim of Albert Lea and many, many nieces and nephews. He was preceded in death by his parents, his brothers, Dale and Glen, brothers-in-law Bert Mckean, Marvin Stenzel and Herb Prescher, sister-in-law Sharon Morreim. In lieu of flowers, donations may be made to the Salvation Army or Youth for Christ.